When you have a pet that likes to wander off, it is important to do everything you can to protect them from going missing or being injured. No one likes having to search all over the neighborhood for a lost dog. As a pet owner, it is vital to provide your dog with a barrier that will keep them safe from escaping and will also keep other animals from being able to enter your yard. For the pet owner that is looking for a way to safeguard their animals, fencing for dogs is the responsible solution. A fence will not only keep your dog safe, but it can also provide an excellent area for your dog to play and exercise. If you are looking for a humane way to protect your dog, fencing for dogs from Benner’s Gardens is a better alternative to other forms of fencing that could potentially injure your dog. Finding the safest way possible to create a barrier for your dog should be at the top of your list of priorities as a pet owner. 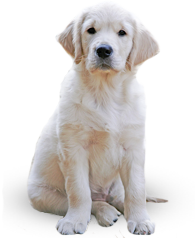 When you choose fencing for dogs from Benner’s Gardens, you can feel confident that you have chosen a pet protection solution that is effective and won’t hurt your pet. With fencing for dogs from Benner’s Best Friend Fence you can rest assured that your dog will have a safe place to exercise any hazards or dangers. You get only the best from Benner’s Best Friend Fence-Your fuzzy family member deserves it! Today’s market does not offer very many effective, visually appealing fencing options for dogs. Thus, many people turn to electric fencing as the only visually unobtrusive fencing solution for their dog. However, electric fences can prove to be not very effective nor is it humane. Electric fences usually work by placing a special collar around your dog’s neck that is remotely attached to an invisible border, they feel an electric shock. The level of shock can be adjusted to accommodate the size of the animal. But these fences aren’t fail proof and can be harmful to your pet. If your dog is clever enough, they will eventually realize two things: if they remove their collar, the fence won’t work and if they bear through the initial shock, it will eventually stop when they get to the other side of the fence. Electric fencing can be effective for keeping your dog in your yard but it won’t protect them from other animals that may enter your property. Fencing for dogs from Benner’s Gardens is not only functional; it is aesthetically pleasing as well. Our fence acts like a constant barrier between your yard and everywhere else, without being a visual obstruction to your home. In fact, from just 20 feet away our fencing for dogs blends right into your property and does not make your property look like a fortress. It also was specially designed to be a humane fencing solution. Unlike chain link fences that can cut your dog, the holes in the mesh of our fencing is made to be small enough that your dog won’t be able to stick their nose through it. The polypropylene mesh construction of the fencing for dogs is thin so it won’t distract attention from your prized landscaping, but it is still strong enough to restrain your dog from escaping your lawn. Our fencing for dogs comes in a variety of different heights that are good for different sized animals and can be reinforced with additional fence posts that will increase its strength. 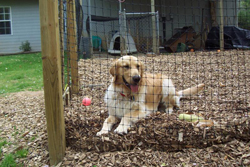 Benner’s Gardens offers you completely customizable fencing solutions for dogs.